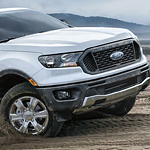 The 2019 Ford Ranger makes a highly anticipated debut on the automotive market of the United States of America. Our team members at Lithia Ford Lincoln of Roseburg offer test drives in three trims of this mid-size pickup truck that has an all-new design. If you want to drive on rough terrains with more confidence, get the exclusive FX4 Off-Road package for this model. Several protective skid plates are included in this optional package that's tuned for off-road trips. For instance, heavy-duty plates prevent the fuel tank from getting punctured on rocky terrains. This durable pickup truck also wears front bash plates with steel composition. Of course, the high-strength steel frame is also engineered to handle demanding conditions. The 2019 Ranger can make a smooth transition from a dry road to a slippery trail. You'll want to use the Terrain Management technology to boost handling on snow, gravel, mud, grass and rocks.